Self seeding trees are a real nuisance. They are nature’s first salvo in an ecological succession that might make your garden a wood. They are a real nuisance when in a good year (for nature) they appear in their thousands in lawns, paths, nooks and crannies. They are quite tricky to control. Even worse are certain trees such ailanthus and rhus which when chopped down produce copious suckers from the inevitable root cuttings made when the top is taken away. Reader Carol is having a problem with aspens which she writes about in my post about tree stumps. It is tempting to retain a few seedlings or suckers that transform into pretty saplings and eventually a small tree. 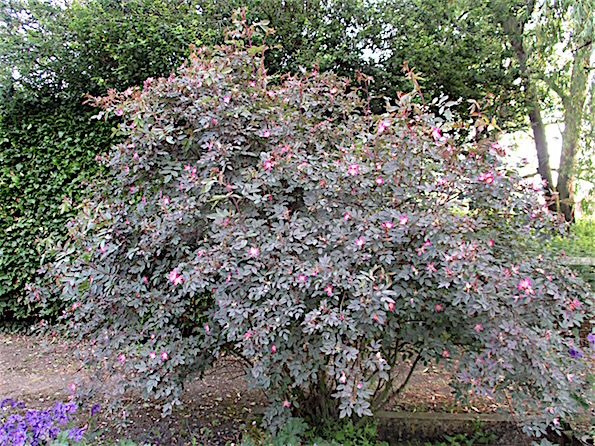 Woe betide a new garden owner who wrongly thinks his tree was deliberately planted. Most gardens are too small to accommodate forest trees. For me my main problems have been sycamore and birch which have appeared in their thousands. As to yew, Peter Williams now has a very fine hedge from a hundred yew seedlings and tiny plants I once garnered for him from a cemetery garden. I have a less pleasant memory of spraying off abundant yew seedlings with MCPA and glyphosate to eventually find my employer had a vision of growing a yew wood! 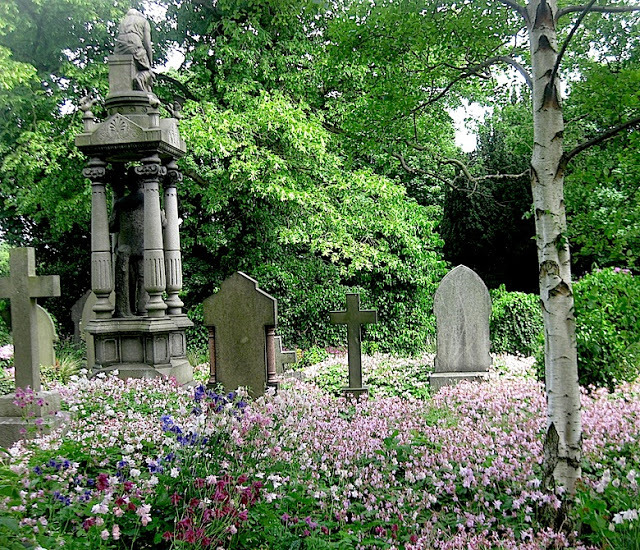 I do admit to enjoying nature's providence by letting a few birches make saplings in my cemetery gardens. It takes a decade or so for them to reach their full glory. If they have become too big I just chop them down. I used to find that these chopped down trees suckered to make lovely multi-stemmed trees. 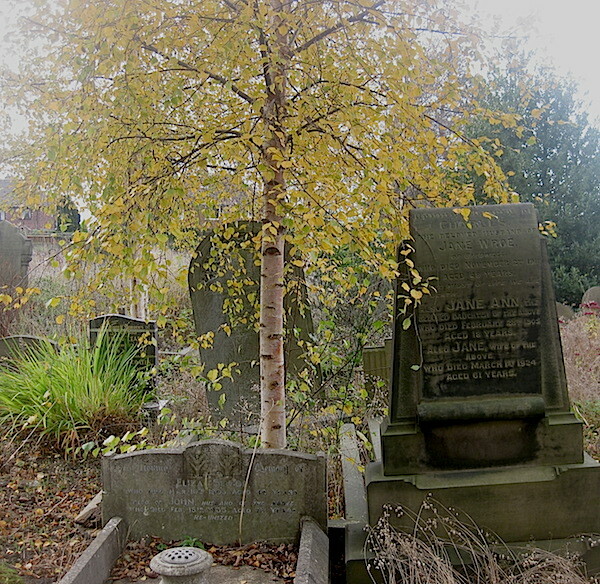 Some birch trees in Bolton Percy cemetery are now on their third cycle! I omit today the treatment of tree stumps. Where herbicides are concerned the principles however are very similar. Their are many ways to actually kill woody weeds. Its just that you need to remember to do it. So often I see tree seedlings left to become a real problem. 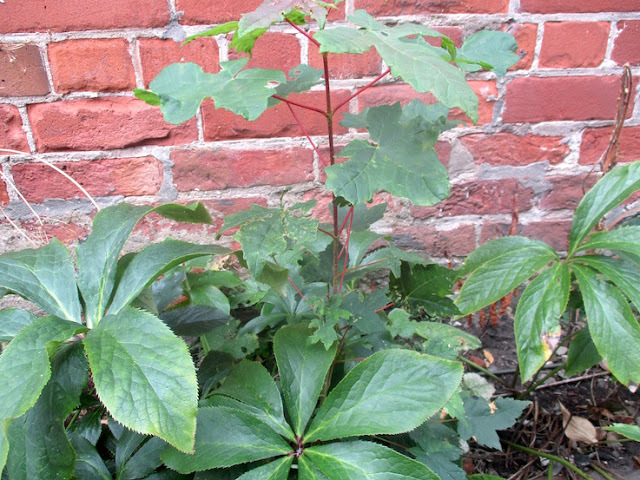 Under an old sycamore thousands of seedlings might suddenly appear in Spring. 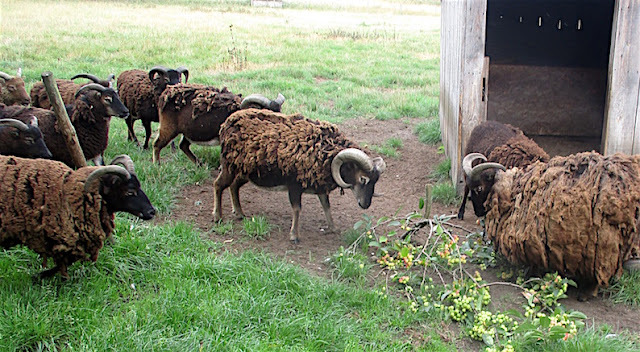 If it has been a cold Winter their necessary cold requirement has been satisfied and should it be a wet season they thrive. In a small garden you can just hoe them away. In a very small garden you can just hand weed. One solution might be to use glyphosate a little bit stronger, perhaps 1 in 40. In practice against woody weeds - and this includes such as brambles I use a mixture of glyphosate and MCPA each at 1 in 50. I would not do this anywhere near delicate plants, only in larger ‘open spaces’ or areas I deem ‘rough’. I buy MCPA as commercial product Agritox and have written about it for example to control nettles in grassland. 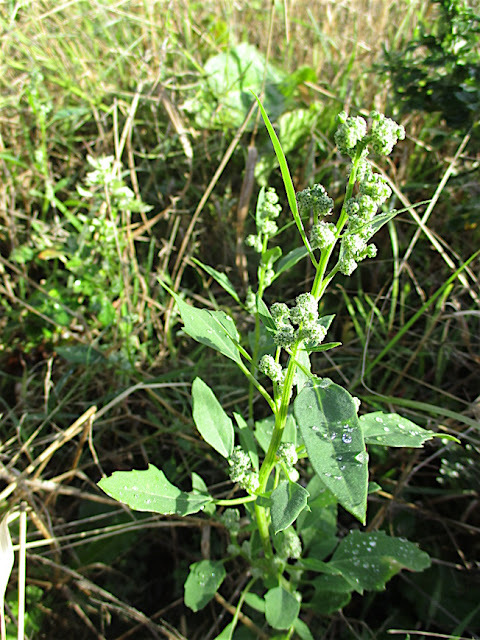 It can be used alone against woody weeds but beyond young seedlings is not very effective. In a lawn woody seedlings just mow out thank goodness! If tree seedlings are allowed to remain into their second year you need a real brushwood killer to kill them. I have used the commercial product Grazon for this purpose. (I also use it for ‘difficult’ lawn weeds). It is quite brilliant but a bit pricy. Your problems start when you allow woody weeds to pass the seedling stage and develop into saplings. Saws, loppers and spades will have a place in your armoury. My recent post, ‘a curious incident’, indicates my distain for actually digging saplings out - huge effort, sore back, broken spades and damaged plants. Frequently if pruned tight to the ground woody saplings will be killed. Some will regenerate, especially those that are older and larger. Do it again later, they soon will be gone for a fraction of the effort of digging them out. If you are timely smaller saplings can merely be pulled out. Don’t use you back. Strain with your arms and if their is no sign of movement give up and go for the secateurs! 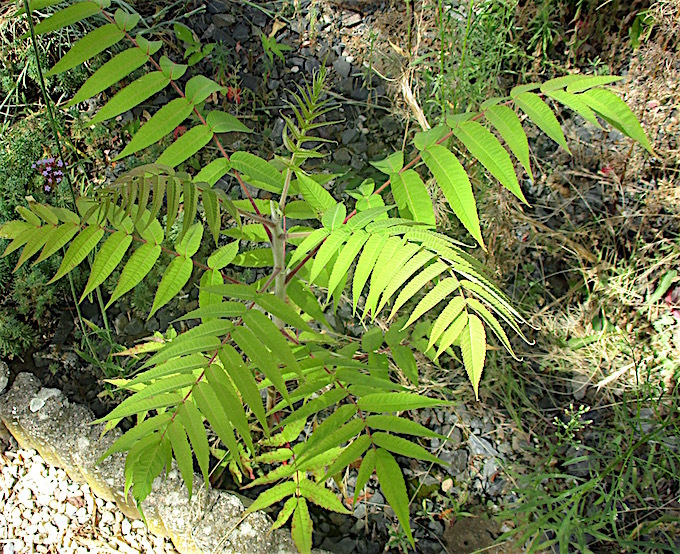 Brenda’s son in France inherited a supposedly grass field full of thousands of four foot high four year old ash saplings. Well beyond my puny efforts with secateur and saw. Eventually he asked his local farmer who in less than an hour flailed them all down. I think Peter’s two grazing horses did the rest and as far as I know the ash has never returned (although on the neighbours property it is now a small wood). 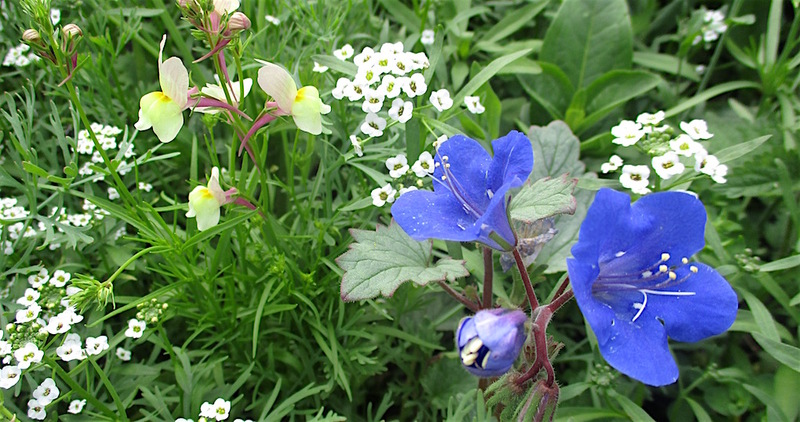 The most admired feature by this year’s garden visitors has been my big blob of sweet selling gaudy annuals. Variously dubbed ‘meadow’ or ‘wild flowers’ it is neither. The flowers are all garden hardy annuals (with a few sneaky short lived self seeding perennials such as Verbena bonariensis and gentian-blue commelina). In the old days it would have been called a hardy annual border. Once popular amongst keen gardeners but found to be labour intensive they never really caught on. On the contrary this year mine has been no trouble at all. I was exceedingly lucky in that at sowing time in early April the ground was still saturated with all that Winter rain. Better the rain continued for another ten days before the long Summer drought set in. I did not need to water despite in the next four months barely receiving an inch and a half of rain. An inch of that very fortunately came on a single night after ten weeks to revive the flagging flowers. ‘Throw to grow’ mixtures now have the image of being naturalistic labour saving garden features. Unlike my experience this year this is not usually so! 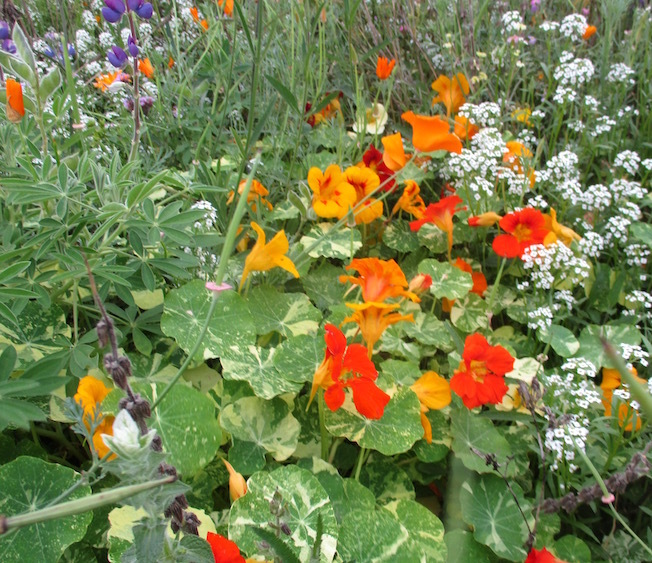 Many gardeners just can’t handle the weeds that out grow the annuals. They are fine for the first year but in the second they need further soil preparation and with an enhanced bank of self sown weed seed and sometimes strengthening nasty perennial weeds soon run out of steam. 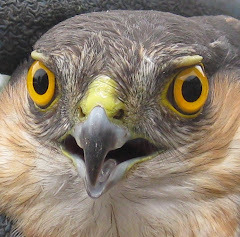 Do not confuse this situation with that of a genuine meadow filled with perennial flowers and annuals such as yellow rattle that have evolved to favour agricultural meadowland. Unfortunately such lovely features reproduced in a small garden can be labour intensive too. 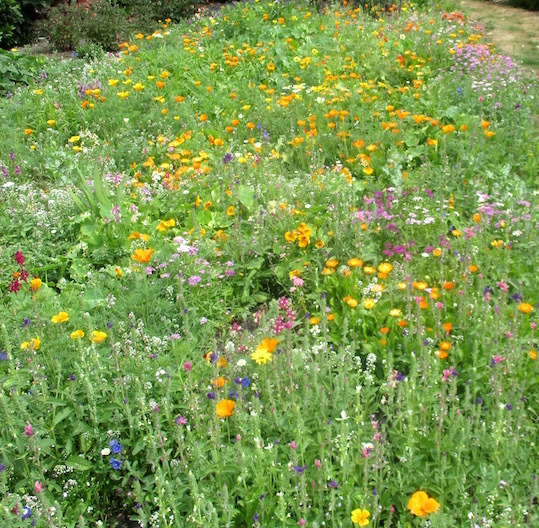 Many of the annuals suited to my annual ‘border’ evolved to colonise regularly ploughed farmland and would compete with newly sown farm crops. Things like poppies and corn marigolds. (Such annuals have usually been ‘improved’ and selected by plant breeders). I have earlier explained how two years ago I took my bat home and more or less ceased to grow vegetables. My 200 square metres of vegetable garden suddenly became vacant. 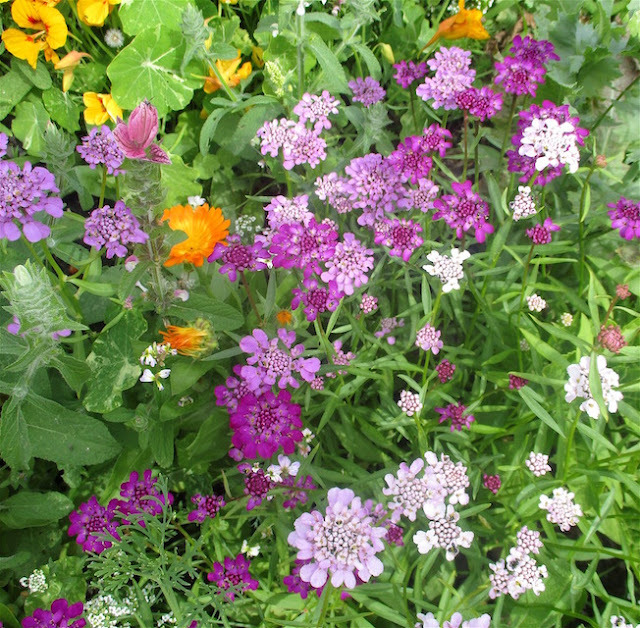 My first pilot year worked reasonably well and this year I decided to go the whole hog and sow the whole plot with a ‘throw to grow’ annual mixture from that excellent seedsman Mole Seeds. As a no dig gardener my plot was ideal. There was little surface weed seed as my methods don’t bring dormant weed seed to the surface. As a user of glyphosate I have zero perennial weed. Couch, ground elder, mares tail and bindweed does not exist in my garden. 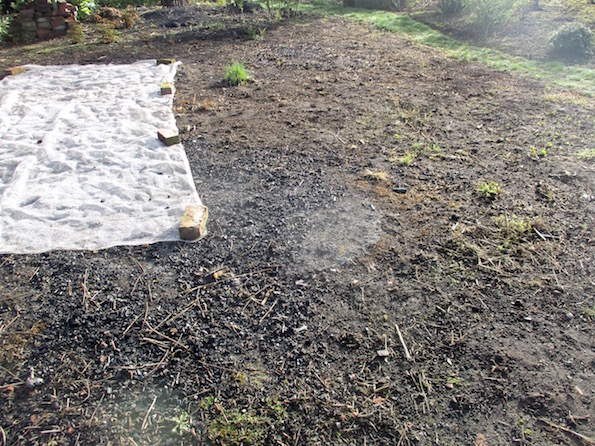 My undug plot is settled and cohesive but if disturbed has an excellent crumb structure partly because there has been years of worm casting - not to mention regular surface mulching of charcoal from my bonfires. 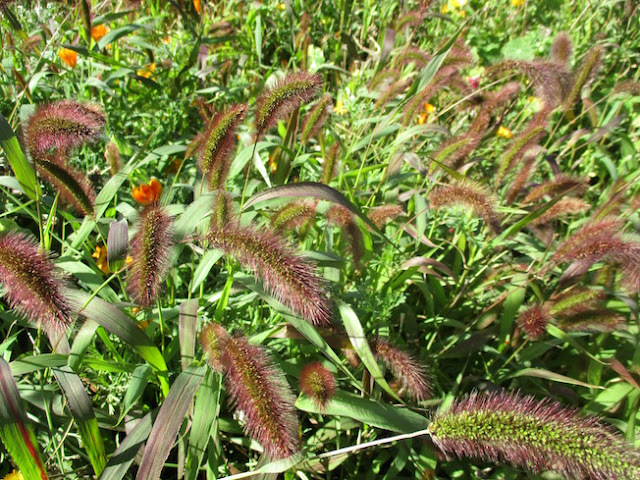 My plot is highly fertile, that is something not usually recommended for annual flowers. I thought my eighteen inch high annuals some flopping together looked rather fine. 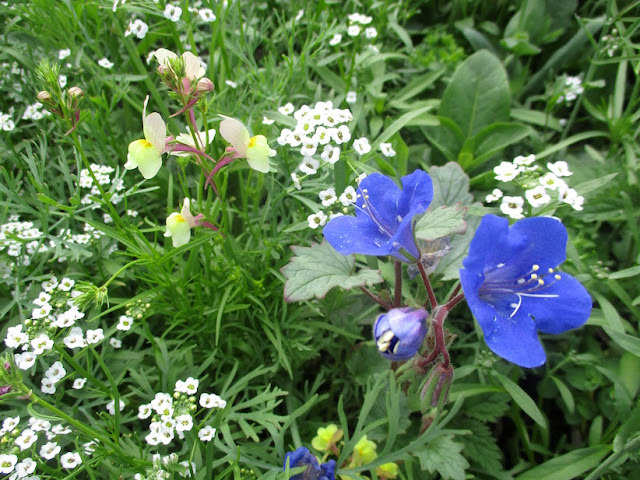 Early April is a good time to sow an annual mixture. 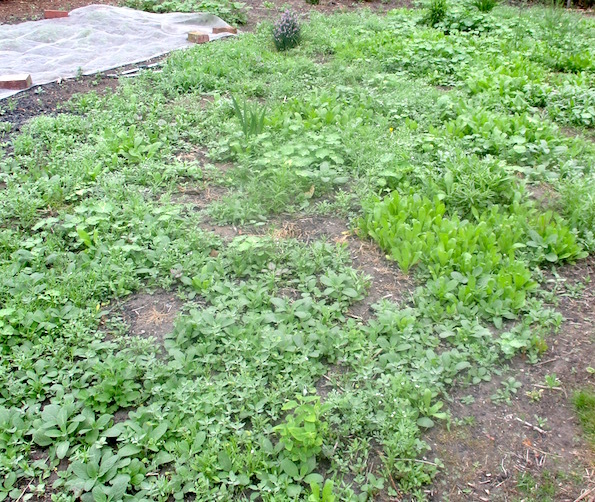 My plot almost weed free, I made sure that any small weed seedlings were totally absent. In my case a quick spray round, although a light hoeing would do. My £20 seed packet was far too much for the site but I used it all anyway. With weed-seed free soil the flower seed was just scattered. As far as I remember I very lightly raked the otherwise undisturbed soil to cover much of the seed. The only further maintenance was to spot treat the very few weeds on my regular garden spray round. As my plants developed I moved to any necessary hand pulling. That’s all that was needed. Although most of the annuals densely germinated at about the same time a few later and/or slower varieties filtered in later and provided some continuity as some early varieties faded. 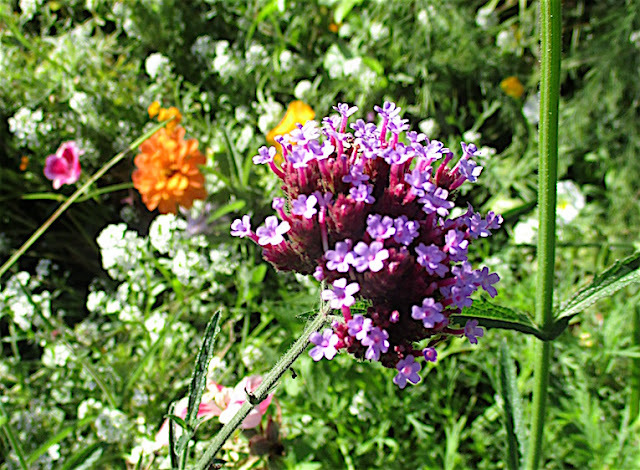 The beautiful honey like smell that pervaded this part of my garden for all of five months was alyssum. 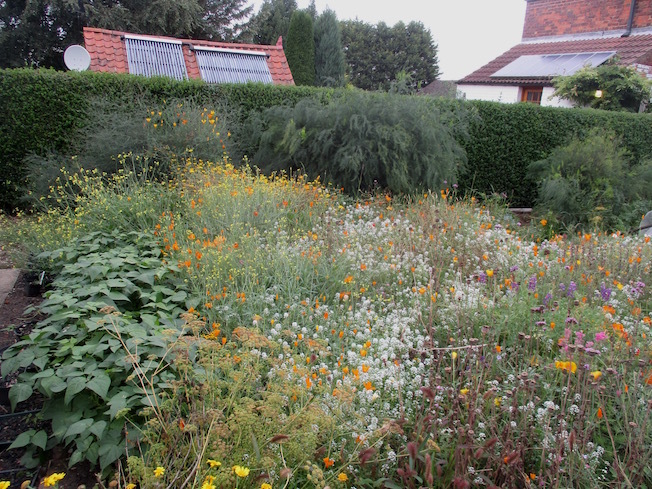 This was generous in the seed mixture and gave the whole scheme a lovely white backcloth. It was starting to fade as the severe drought cut in but revived strongly when three months into the project it did actually rain. There were a few ‘cheats’ where I welcomed a few self sown remnants of the garden's previous life. Verbena bonariensis came in as lovely purple curtains. The lime green flowers of edible rocket looked really nice and a lovely fox tailed grass whose name I don’t know looked superb - but might be a problem next year! 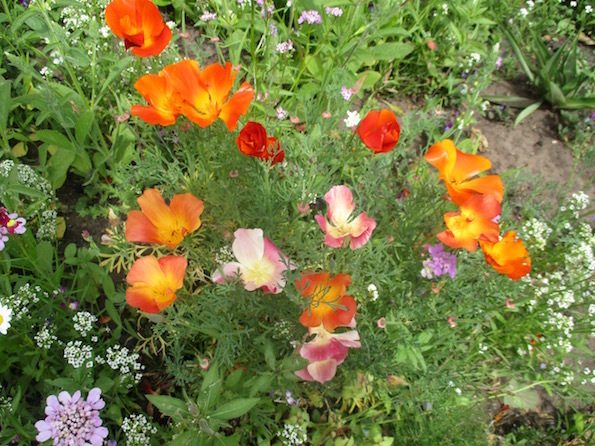 I do not know how many of the prolific seeds of the annuals will germinate next year. This will be a voyage of discovery. I don’t know yet to the extent that I will need to resow. A visitor asked what I will do with the prolific Winter dead vegetation. I expect it will more or less collapse and disappear. I am prepared at the turn of the year to rake off strawy remains. There will of course be no soil cultivation! No weed will be tolerated during this Winter period. My regular spray round will take care of that. I have already collected and scattered seed in other places where I have ongoing garden projects. 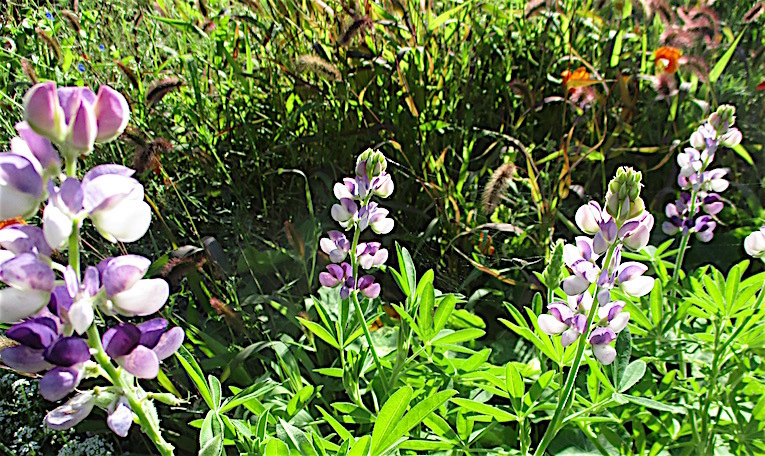 Lyndi’s field needs more colour in Summer and the village plot has been denuded of some of its perennials by two Winter’s flooding. There is even a place in Cathi’s grass verge. I said at the beginning that it was flowers without the meadow. 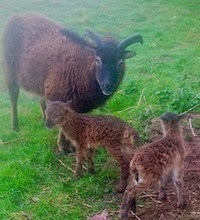 In truth I did sow thinly that lovely fine grass Chewing’s fescue. This was more in the expectation that I might use a few grass plants to later patch up my lawn. 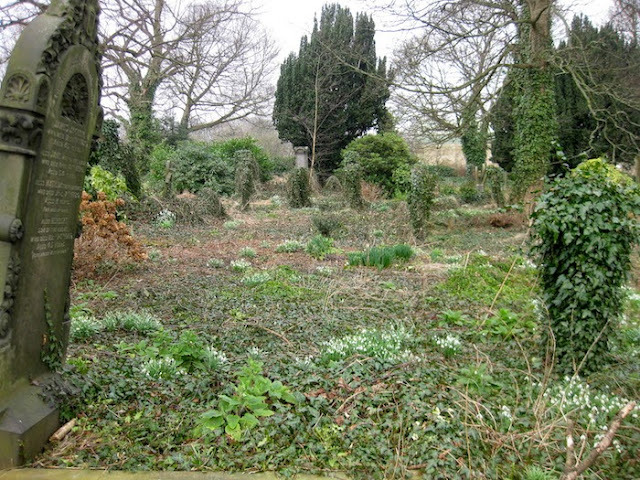 It was completely outgrown although there are a few lovely dark green grass patches looking nice on the fringes. You can read about my exploits in the girl’s garden by putting Cathi or Lyndi into my search box. 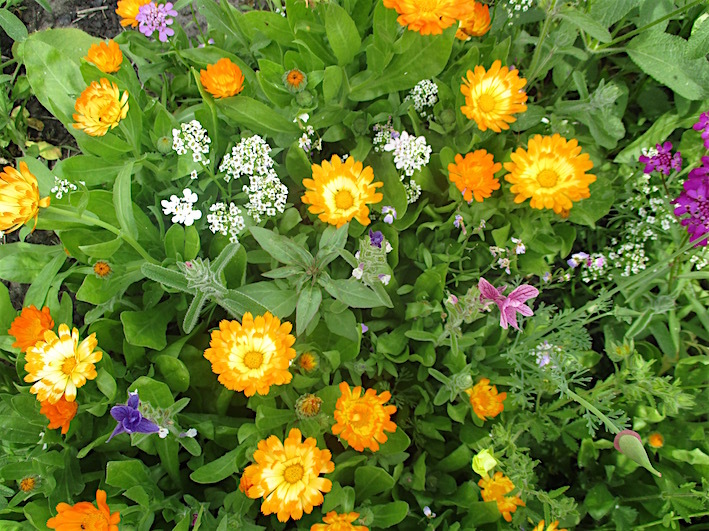 The search box is very efficient at digging out my previous posts such as wild flowers, charcoal, fescue grass, Mole seeds and named plants. Use it and lose it; show off your crumbly soil and its gone! My older readers have heard all this before but I feel today I need to reclaim my no digging credentials. In particular I want to challenge the crazy outmoded idea that regular stirring the soil around established plants somehow aerates it. It’s the wrong type of aeration. Instead of a network of channels made by natural causes such as roots, worms and natural cracking that facilitate air movement and drainage instead there is imposed a complete destruction of soil structure. Oxygen reaches the most intimate organic structures and oxidises them away. Soil particles are torn apart and exposed in tooth and claw. Worse when settling out after this damaging process, wetting and drying impose rocklike hardness and it becomes necessary to cultivate again. The trouble with intensive soil cultivation is that although it provides excellent short term conditions for sowing and establishing new plants the effect fades away and a gardener or farmer needs to cultivate again. In particular fluffing of the surface soil turns gardeners into soil stirring junkies. Crumbs are aggregations of particles and organic matter. They are particles mixed together loosely combined by natural gums and glues and other beneficial organic manifestations. In the last couple of decades the significance of fungi in this binding together has been discovered. Strands of mycorrhizal fungi and their (relatively slow) breakdown product glomalin has transformed our understanding of soil structure. Farmers these days sow all year round and have wonderful machinery to prepare the ground for them. Well actually brute force. So too the gardener, although I do believe many gardeners prepare their planting tilth excessively fine and too often. 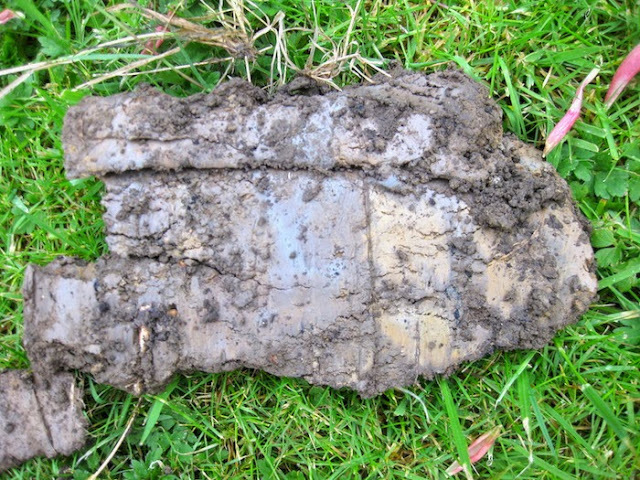 Tilth making is a delicate process and where followed by heavy rain or irrigation can damage the soil in the same way as soil is damaged in the afore mentioned beaker! Unfortunately tilths on certain sandy soils slake down in heavy rain and if followed by rapid drying form a hard cap. The settled soil in a no dig garden is firm and cohesive. It’s softer where the gardener uses extensive mulching of compost but this is not my way. Don’t confuse a settled soil with compaction and if the surface is disturbed by a light forking its lovely crumbly structure is revealed. Don’t do this to tell the world you will have a beautiful soil - exposing it induces its destruction. Don’t confuse soil with your childhood buckets of loose sand on the beach! Good soil should be a cohesive whole, not lots of loose granules. Although benefits of stopping to dig can arise after six months or so the real benefits arise over the years. The longer soil is left undisturbed the better. In due course the surface starts to reflect beneficial natural processes not least the action of worms casting their intimate mixtures of soil and organic matter. 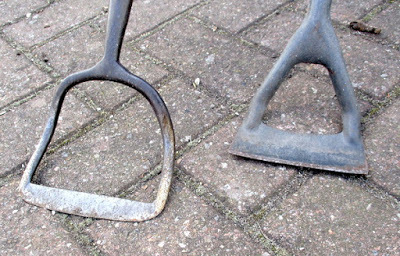 Should the gardener wish to make a seedbed all he needs to do is to lightly scratch the surface with a rake or for larger seeds make a drill with a stick or a hoe. 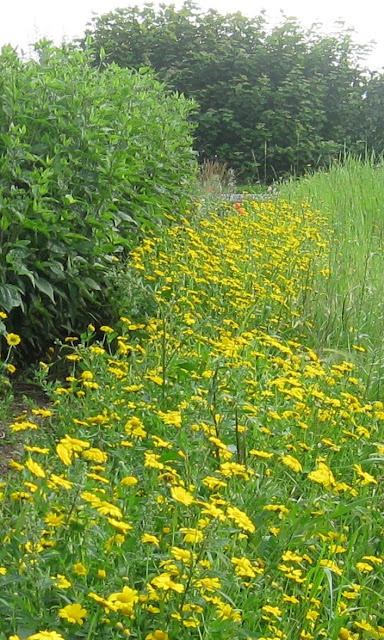 Can the no dig gardener hoe to control weeds? Yes, but not deeply in the traditional way loosening all the soil surface. 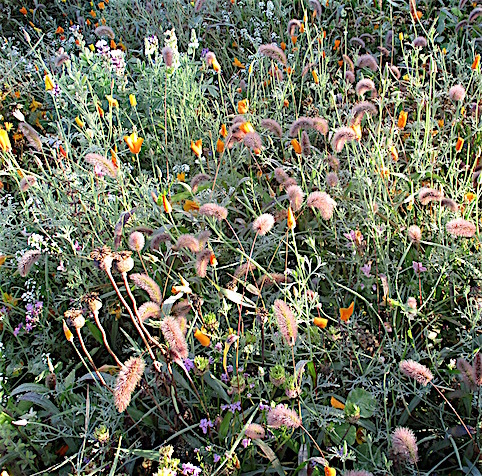 Just hoe the weeds severing them at or just below ground level and leave them to desiccate and die. 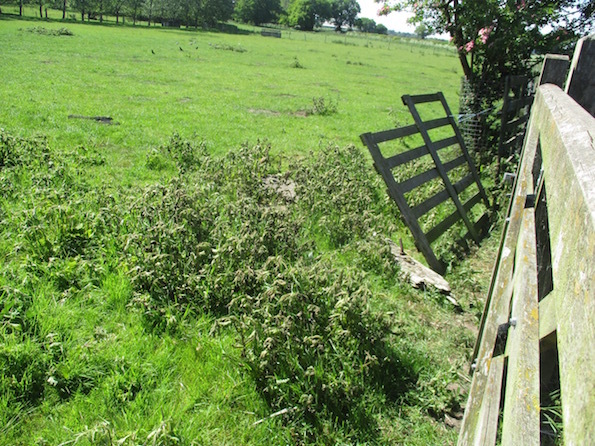 I generally control weeds with glyphosate but sometimes hoe in dry or windy weather. My own sandy soil grows luxuriant liverwort in wet weather. I treasure it around my pond and generally tolerate it in my borders. My friend Peter has a consuming hatred of it and in dry weather lightly hoes or rakes it away! It is sometimes necessary to disturb the soil Keep it to a minimum. Let the quality of your plants tell the world what a good soil you have and what a good gardener you are. Thank you Sue Garrett for the opening picture. 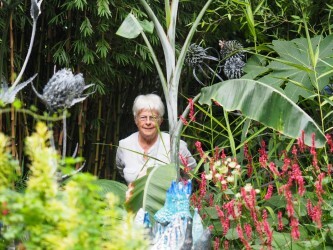 Sue visited my garden recently and made an excellent video of my acre garden. You won't find very much loose soil.